We drive a normal Land Criuser HZJ 78 (1HZ diesel). The only modification we had made was a heating for our fuel pipes and the diesel filter, as well as an extra pre-heater which was put in somewhere between fuel tank and fuel filters. Both were nice to have, but actually WE NEVER USED IT ! (installed for around 400.- US Dollars at ARB in Almaty, Kazachstan). An engine oil like 0W-30 did the job very well. We also had changed transmission oil to Castrol Syntrax 75W-140. We drove with spiked tires (available in Irkutsk) and we absolutely recommend it, because roads up to Magadan are very icy. Have a good oil for your door locks by hand, sooner or later they will freeze. We put a simple piece of carboard as wind protector for the radiator. We had a Webasto heater for the cabin. It worked fine down to -35°C. Below -35°C it started to built up a lot of smoke and finally didn't work anymore. The reason was condensation water built up in the exhaust pipe (and probably froze). This clogged the exhaust and finally stopped the Webasto. By drilling a little hole in the lowest part of the exhaust we solved the problem. Our shock absorbers (Old Man Emu) got hard as a rock at -38°C. So it was like driving without suspension! We didn't dare to drive on like this for distances. There are probably two ways to solve this problem: Get new shocks which work at very low temperatures or take the shocks completely out! 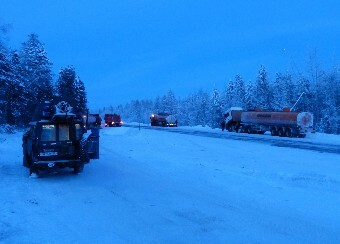 After a night at -40° or below Differential oils were stiff and the car rather hard to move. So you will have a very slow but not impossible start. 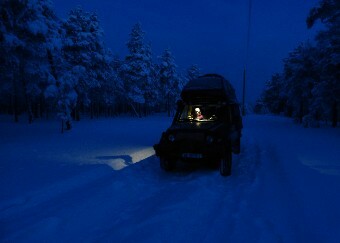 We had extremly warm sleeping bags, so we were able to sleep without heating at -28°C. It was not very comfortabel because the air feels very cold to breath and you will get a lot of condensation but it works. Normally we slept with the heating on. Then we slept in normal down duvets and a warm pyjama. While we didn't drive we had the Webasto running to have a comfortable and warm inside. When temperatures dropped below -35°C we didn't turn off the engine during the night because we were afraid we couldn't start it anymore (stiff oils and low battery power). Above -35° we never had the slightest problem to start the engine. 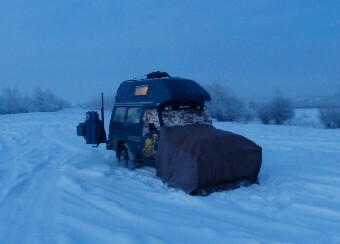 So below -35°C we slept with the car engine running. Vibrations and noise are a bit uncomfortable, but the heat from the engine is fantastic. We turned the heating on only on the lowest level and this was enough to keep the temperature well above 0°. It takes 8 Liters of diesel if the engine is running at 800 rpm during a 10 hour night. During night time we covered the car bonnet with a felt cover (which we had made in Mongolia) to protect it from wind and heat loss. We covered our windows with a simple blankets to protect it from frost (which takes a long time to get rid of in this cold temperatures). You will get a lot of condensation water inside the car (during the night). So it will take some time in the morning to get a clear windshield (scratch it off and let the engine run for 20 minutes). Sibiriacs drive with a double windshield: They cut out of fibre glass a windshield which they use as a second layer. They tape it over the original windshield (double glassing). This prevents condensation. It is nice to have but we where quite okay without one. Never camp in a valley or depression, temperatures can easily be ten degrees colder than on a higher spot. Don't pull the handbreak during your nights stay it will freeze. We had two 20 Liter water bags inside the car. During the night we placed them in front of the Webasto heater (or driver seat when engine was running overnight). This prevented them from freezing. Food which shouldn't freeze (like milk, vegetables, bread) we put in our (turned off) fridge. We were able to keep the temperature inside the fridge constantly above 0° because the cabin temperature was over the freezing point at nighttime (Webasto) and during daytime - when the temperature in the back of the car was well below 0° - the freezer worked as a warm keeping box because its insulation was good and the cold couldn't get to the food.